Books On The Square in Providence will host Priscilla Warner at 7pm. Priscilla, along with co-authors Suzanne Oliver and Ranya Idliby, are out on tour to promote the paperback release of this very special book. 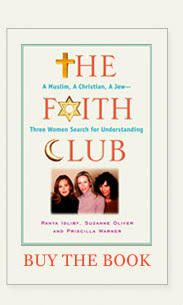 Please visit www.thefaithclub.com for more information. Priscilla will be reading,taking questions and signing copies of TFC -please stop by! That's 7pm this Friday at Books On The Square in Providence on Angell Street. For more info please call the store at 331-9097.